New Delhi: Media and politics are set to become an even headier cocktail as several news ventures — many of them promoted by politicians — are in the process of being launched. All these ventures will be looking to cash in on the heightened interest in the forthcoming Lok Sabha elections. 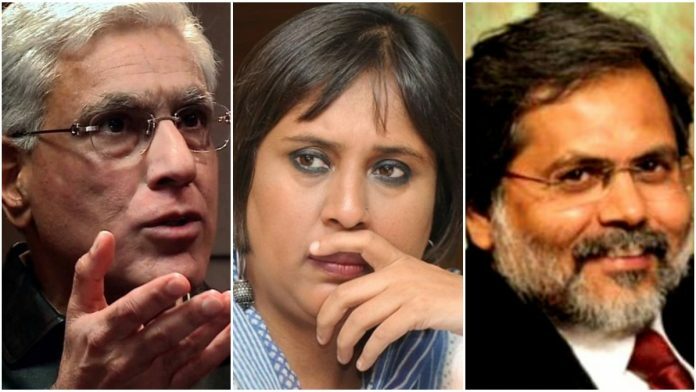 In the pipeline are news channels, online portals and even a newspaper as the ventures will see the return of several high-profile journalists such as Barkha Dutt, Karan Thapar and Punya Prasun Bajpai. The churn is set to engulf the language sector as well, with Arnab Goswami’s Republic TV set to launch a Hindi news channel in February while Hemant Sharma, formerly of India TV, is working on launching a Hindi channel for the TV9 group, along with journalists Vinod Kapri and Ajit Anjum. Sharma is known to be close to the BJP and the RSS and had fallen out with India TV’s Rajat Sharma. He had quit the channel after his name was linked to a group of people under investigation for suspected fraud in a medical education scam in Haryana. Sharma did not respond to calls from ThePrint. Harvest TV is expected to be the first off the blocks. The English news channel, which has Congressman Kapil Sibal as one of its promoters, is set to go on air from 26 January. It is owned by Veecon Media that already has licences for English, Hindi and other regional language channels. A Hindi channel will follow the English news channel, as per reports. Barkha Dutt, a consultant for the channel, will anchor a prime show and so will Karan Thapar. Other prominent TV anchors such as Seemi Pasha (ex-India Today) and Vineet Malhotra (ex-Times Now) are also expected to be a part of the channel. When asked to confirm his role, Thapar told ThePrint to “please speak to Harvest TV about it”. Dutt refused to comment. There is speculation that former ABP News anchor Bajpai, who had a much-publicised exit from the channel, will be a part of Harvest Hindi. He said that he is on the verge of joining a news channel but refused to name it since negotiations are still underway. Insiders at Harvest TV told ThePrint that launch preparations are on in full swing. “The promos are being shot now and will be on air before the launch,” said a source in the channel. Choudhry insisted that the channel “will not be partisan”. If it is as provocative as Republic TV with Goswami, it could well shake up the Hindi news channel space currently dominated by Aaj Tak, ABP, India TV and Zee News. Republic’s Hindi channel comes close on the heels of the launch of Swaraj Express, which went on air in November. It is headed by Gurdeep Singh Sappal, the ex-CEO of Rajya Sabha TV, and advisor to former Vice-President Hamid Ansari. He is known to be close to the Congress. Those launching Hindi news channels clearly see potential in the market. Data from the Broadcast Audience Research Council (BARC), which analyses approximately 70 Hindi news channels, indicates a 28 per cent jump in viewership during the 2016 -2018 period. With 20 per cent of all newspaper readers in 50-lakh plus population towns reading them online (Indian Readership Survey 2017), this space is set to expand. Dutt is expected to join this bandwagon with industry sources saying she will launch her new digital venture in March. Dutt refused to comment on this. Two other online launches by experienced journalists are in the offing. Asiaville is one such venture. It is being launched by Sashi Kumar, who founded and chairs the Media Development Foundation, the not-for-profit public trust that runs the prestigious Asian College of Journalism (ACJ) in Chennai. Jairaj Singh, former editor of Daily O, will be the editor and chief producer for Asiaville. Kumar told ThePrint that Asiaville will be multimedia and multilingual digital news venture that will be operational by the end of January. “It will be in four languages, Hindi, English, Tamil and Malayalam,” he said. Investigative journalist Josy Joseph is also starting a news portal. He hopes his project will take off by early 2019 and said that it will focus on “academically-rigorous” content. As for the print media, Network 18, the promoters of CNN News 18, News 18, and the news portal Firstpost will start a weekly newspaper of the same name, with Praveen Swamy as its editor — Arun Jaitley did a video-link launch of the newspaper from New York, on 17 January. The Reliance group owns the media enterprise. The first edition is expected to be out on 26 January. Bots of post truth era created recently commenting on truth. All the jokers are in one pack! That is the only positive thing that I see in the strangely named Harvest TV. Kapil Sibal’s last media venture was Tarun Tejpal’s Tehelka. The man obviously does not learn from his mistakes. Same old stuff with new facelift.But like Chadambaram said to have promoted NDTV Kapil is running fast to this one.Otherwise also Tehlaka has gone into dabba since long.Kapil requires mouth piece to piss against BJP RSS and Modi. The word ‘Harvest’ is generally used by Christian missionaries to refer to their success on conversions. Going by who is supporting the channel and the party he belongs to, the name is very apt. It would be laughable to claim it will be non-partisan. It’s time channels openly declare their political affiliations. Why do these men and women take a refuge in a channel run by a lawyer who fought Lalithambika Yadav fodder scam cases before he became a Rajya Sabha member courtesy Lalu?What is their credibility? I don’t think none will care to hear them. People are not interested in news now there is no news now all is fake news who have time and money to waist w I’ll look watch be it. Read nullification instead of nullification and NaMo for Namibia. Jobless and discredited bunch getting a last refuge to show they are in business. None will watch Harvest. These guys ran a nullification campaign for l2 years against Namibia and had failed disastrously. Now a last and finally to end in doom. It is a joke if Sibal is there and want to call it as giving Truths, he does not speak truth, as a lwsyer, he speaks lies all the time that will appear to be truth, these corrupt politician who looted the country woth Sona, Rahul and PC, looking to win in 2019 election by hook or croook by spreading lies, they aleady spread lies on rafale despite numerous clarifications and truths, through other media like NDTV, Indian express, Hindu and IBN, one more to spread the lies. Proposed Harvest Channel by Kapil Sibal talks of focussing on Truth?. Well! Where Kapil Sibal, Barkha Dutt, Rajdeep Sardesai and the like are there, truth has to be kilometres away. Karan Thapar is at best a side kick having been looked after by the Dynasty for decades. However, one thing is going to be very good for the public. It may not be difficult for the public to see all the Jai Chands at one place; sometimes people get confused to identify wolves in sheep clothing. It would be so much easier now. Harvest TV or “Congress” TV ?! So all Congress’ harvests in one place. I wonder if DDnews is still around. Amongst this crazy agenda led news reporting/drama, I seriously miss the boring old days of “here is what happened on DD news” (and you go make your own mind of what you think about it). Barkha clutching at straws, hahaha!!! This news is not at all a surprise. Well. THIS is ONE channel I shall never pay to watch. On second thoughts, I shall not watch it even if offered FREE. Crowded space. For old fashioned folk like me, there is only one expectation : Satyameva Jayate. “Politics” and ‘Satyam’ are a contradiction in terms.